glslLangValidator is GLSL tool for Windows / Linux released by the Khronos Group. glslLangValidator is the official reference compiler front end for both OpenGL ES and OpenGL shading languages. It implements a strict interpretation of the specifications for these languages. It is open and free for anyone to use, either from a command line or programmatically. More information about can be found here: OpenGL / OpenGL ES Reference Compiler. You can download the command line version from HERE. I quickly tested glslLangValidator with the following GLSL 1.40 (OpenGL 3.1) vertex shader took from GLSL Hacker code sample pack. Warning, version 140 is not yet complete; most features are present, but a few are missing. I guess it means there’s no error. 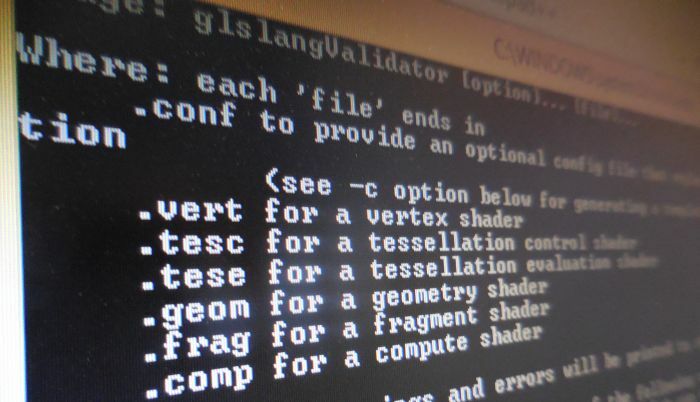 According to the documentation, the current version of glslangValidator supports GLSL shaders up to GLSL #version 1.40 / OpenGL 3.1 (so why it tells that version 140 is not yet complete? Is it related to the machine I currently use to write this new? ).